On the third floor of The Cosmopolitan Las Vegas Hotel and Casino, there is a little hidden pizza place that many don’t even know exists. In fact, this place is so well hidden that it doesn’t even have a name. I found it by chance when Rose and I stayed at The Cosmopolitan in November 2011 as we were looking for something quick to eat. An employee who works near the escalators pointed us towards the dark hidden hallway, completely accessible to the public, but not very well noticed. As we walked through the Saturday night crowd, surrounded by expensive restaurants and the glitz and glam of one of newest hotels and casinos in Las Vegas (and my personal favorite), we walked through the hallway and found ourselves surrounded by darkness and memorabilia. Moments later, the atmosphere changed. The smells changed. It was like we were instantly transported to a New York style pizzeria, complete with white and black tiles and arcade games, starkly opposite of everything else in The Cosmopolitan. But this place is perfect. It’s not too big or busy and the pizza is fantastic! If you plan to visit The Cosmopolitan and enjoy the secret hidden pizza place, be sure to save room for dessert. Just steps away from the dark hallway is Va Bene Caffè, a coffee and gelato shop that makes some of the best ice cream I’ve ever had! 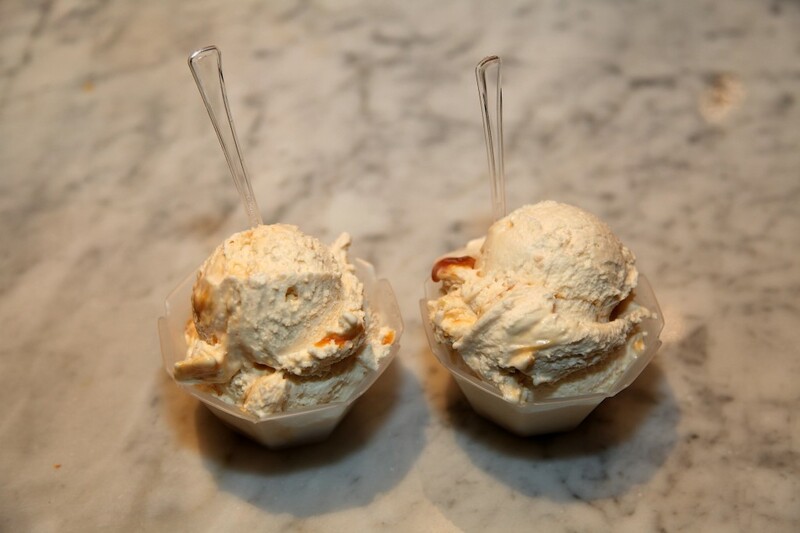 We highly recommend the peanut ice cream and found that to be our favorite, so much so that we visited Va Bene Caffè at least four times during our two night stay! My November trip to Las Vegas was my sixth time in town and The Cosmopolitan Las Vegas is now by far my favorite Las Vegas hotel and casino to stay at! Be sure to check out the HDR photo I took of The Cosmopolitan balcony view overlooking the Bellagio fountain and the Las Vegas Strip.